This book is set in Iran in 1942, and is about a normal girl who lives in a house, but she believes in magical creatures. One day, she sees that there are random men digging a hole in her garden. She asks her sister what is happening, and her sister replies that they are digging a hole for a new outhouse. Naji immediately gets agitated, and worries that they'll disturb an evil force. So, Naji starts watching - then her mother shouts to wash up. A few days later, a man comes over to fix the pool. Naji believes that he is a looloo (a kind of child-stealing demon), because he has the name of one of the looloos. She is told to go and give him some tea, so she goes and sees if he is actually going to take children from their parents. Even though she is not stolen, she still wants to learn what is down that hole - she feels like some monsters will pop straight out of it. Is she right, or is she not? My favourite part in this book is where Naji goes to see if the man that was there fixing was actually evil, because, while she is going to see him, the book describes all her thoughts. I like this book, because it has a very wide age range, and is fun for probably even grown ups to read. It has a lot of imagination for the 150 pages it is, and it has a lot about Persian culture in it. How many times have you moved? If you have, you'll know that it's very hectic. In this story, Falafel is fed up with moving. Of course, Falafel isn't her real name. Her real name is Zomorod (Cindy) Yousefzadeh. She gets called Falafel, because her next-next door neighbour is a little bit crazy. Zomorod's parents are from Iran, and it's the late 1970s, a time when there is a revolution in Iran, and the Shah is going into exile. When the revolution happens, there had been a Persian Shah for 2,500 years. Falafel is just a normal girl who wants to make friends and have fun. Her parents don't speak English, so Falafel has to translate for them, and she does not enjoy that. Zomorod changes her name to Cindy, to fit in better. When the revolution happens, people in America don't like Iran, and her father loses his job. They don't know what to do. At the beginning, there is a dedication: "To all the kids who don’t belong, whatever the reason." This book is about and for kids who don't belong, and I hope that all children going through not belonging anywhere will find friends and be happy. When her father dies unexpectedly, a young woman and her mother are forced to seek the charity of extended family. The uncle, an accomplished carpet knotter, takes the young woman (we never discover her name) under her wing, and, against better judgement and his wife's advice, teaches her to design, plan and execute her own carpets. Despite her obvious giftedness and skill, this is not a rags to riches story, instead, a familiar plot of hardship, unfair treatment, and unlucky circumstances. The book takes place in Persia around the 1600s, and describes to the reader the sights and sounds of ancient Persia. The heroine is all too human, with flaws, spirit, and anger. Following her life story made me in turn want to weep for her and shout at her. I did enjoy the detailed reference to carpet knotting, appreciating the research that must have gone into these sections. The Reason I Jump doesn’t have a storyline, it’s a book written by an autistic boy about what it is like to be autistic. He was 13 when he wrote the book. He explains that he learnt to speak with other people by using a board with letters and numbers on, that he could point to, so that he could have a conversation. He says that he can’t control the noises he makes, and he forgets things quite quickly, so he might do things that somebody told him not to do. He’s not trying to be naughty, he’s just forgetful and is trying out new things for him. I would recommend the book to anybody who is a parent or relative to an autistic person, because I think it is really important to understand, although Naoki also explains that not every person who is autistic is the same. I think it is really important that Naoki has written “The Reason I Jump”, because it is written by somebody who is autistic, rather than somebody who is not autistic trying to explain what it’s like. It would be a great book to have in a school library, and I also like that it was written by a child. I read other reviews about this book, many very positive, and one that calls it "mundane", as though that were inherently negative. Hitomi is a young woman who works at Nakano's Thrift Shop - not an antique centre with inherently valuable items, but the kind that sells the results from estate sales. Hitomi enters a complex relationship with Takeo, the other employee, not quite a love story, more a series of encounters, some romantic, some confusing, some, yes, mundane. But it is this mundaneness that is an art form in and of itself, looking at the lives Hitomi, Takeo, Nakano, and their friends and customer, the lives of "ordinary" people who wriggle along as best they can, forming connections, growing estranged, and re-connecting. This is a gentle book. It never shouts, although, on occasion, there are sections that remind the reader that the main character is a young, contemporary woman, which forms a contrast to the general "ticking along" of the story. To me, the items in the shop are metaphors for the experiences and connections of the characters - attributing value to them is personal, and sometimes, this value isn't recognised until much later. Toby says: The Big Wave was about scariness, happiness and sadness. There was a little boy called Kino and his friend Jiya. They lived on a volcano by the sea. One day, a big wave came and smashed people's houses, and people died. Jiya's Mum, Dad and brother died, so Jiya went to live in Kino's house. The boys were happy before the big wave came, but then came the big wave and they were sad. Sometimes, things are scary, but you still do them. Sometimes, even just living can be scary, but if you have friends, then you might not be so scared, but you might still be a bit scared. Mummy says: This is a beautifully written story about friendship through hardship. It explores grief and sadness, and although it is short and covers quite a bit of ground, it reads very calm and "quiet". A lovely find, and I'm sure we'll return to it. The book shows that different things can help the world, even dancing. Hari's dancing makes people happy, and that makes the world a better place. I liked the book because I write letters to other countries to make the world a better place, and it's great to read about other children doing what they love and helping people. 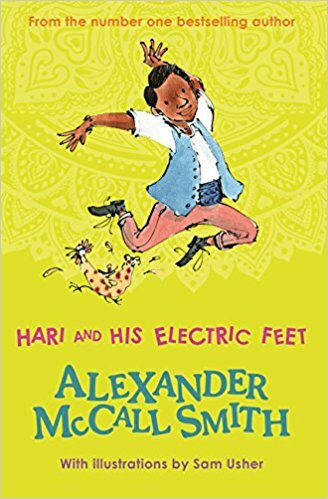 I really enjoyed the part where Hari first starts dancing, and two chickens and a dog start dancing with him. 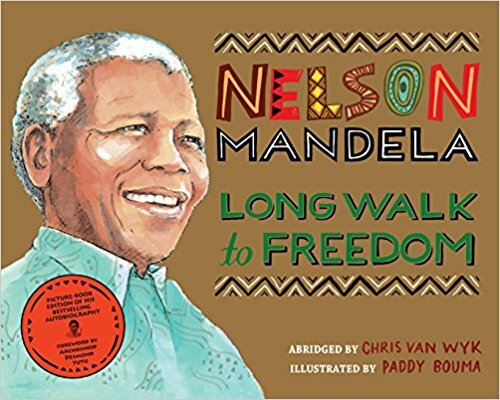 We bought this book when Nelson Mandela died, but it took us a while to read it. I didn't like how people weren't all treated the same, because that isn't right. 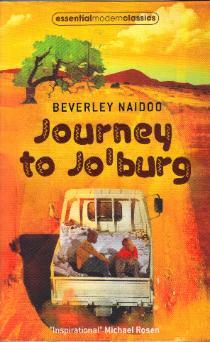 Naledi and Tiro were very brave to go travelling all by themselves. ​I wrote a letter to Nelson Mandela when he was sick, because I wanted to thank him for making the world a better place. I had several non-fiction books about him, but after he died, this book came out, which is all about his life. I liked reading about his childhood. I think you should read the rest of the series before this one, because there are lots of references to the other books in this one. Lauren St John was born in Zimbabwe, but because the book takes place in South Africa, we are putting it here, and we have another book by another Zimbabwean author for Zimbabwe, too. Ben and Martine are best friends, and always love to race. However, Martine is not riding a pony, she is riding a white giraffe, who got saved in a previous book. Martine used to live in England, but her parents died in a fire, and Martine came to live with Ben and his family in South Africa. In this book, Martine and Ben go on a rhino-saving adventure. It all starts on the Stars and Stripes Safari. Martine's favourite band are there, as well as some hunters and some surfers. The hunters say they have hunted bears in Romania, but that they don't want to kill any African animals. Right at the end of the tour, Martine shows Jayden, the leader of her favourite band, the hidden spot of where the rhinos are, a mother and a child. But she doesn't know what's about to happen. BANG! Martine wakes up in the middle of the night and runs downstairs. There is a big helicopter, and in it, she sees the shadow of a man with a gun. One of the rhinos has been hit. It was the mother! Martine and Ben need to take the baby to another reserve! I liked this book because it is very action-packed, and when you read it, you get a very good picture of what is happening. 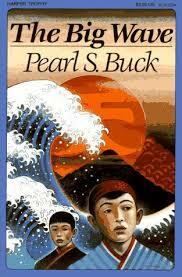 It was very enjoyable to read, and probably in the age range of 7-15. This isn't just an adventure book, it's a bit of a magic book, too. Martine has healing powers, and my favourite part of this book was right at the end - you'll have to read it to find out. I was a teenager when Nelson Mandela was released from prison, and, like many others of my generation, I read the books that were popular in that era - I read Donald Woods' "Biko" and John Briley's "Cry Freedom" (though I never watched the film), and Winnie Mandela's "Part of my Soul". Around the same time, I also read another book, Doris Lessing's "Desdemona, if only you had spoken". Out of all books, this one stayed with me the most, even though it isn't (at first glance) related to the topic here. Doris Lessing gave voice to female characters - both in history and in literature - allowing them long monologues where they had a chance to explain themselves, to flesh out their characters, to be "more". I always thought they were the perfect monologues - innovative, fairly unknown, and interesting. Ndebele's book reminds me of this. Four women, at first disconnected from each other, are waiting. For various reasons, they are finding themselves without a husband - one went away to study, one went away to work, one died, one went into exile - all legitimate reasons, but as months drag into years, the women experience a kind of limbo. Society has certain expectations, and they are trapped in their existence, no matter what they do. When they meet (it is not described how, nor does it matter, there is a "meta" quality to this book, where the characters themselves seem aware of their imaginary existence), they decide to play a game, each looking to address Winnie Mandela, a waiting woman like they are, but waiting much more publicly. They ask questions, they draw out things they have heard, seen and read, and they engage with their own experiences in relation to Winnie's, inviting her to join their circle. When she does, she becomes one of them - questioning, searching, reflecting, acknowledging. I found this book utterly fascinating - like the monologues composed by Doris Lessing, here are women who are given a voice to express themselves. But of course, it is their imagined voices, imagined by authors who have a way with words (at the time of the publication of the book, Ndebele was Vice-Chancellor of the University of Cape Town), and who can make us listen. This book reminds me of people whose stories need to be told, and consider the complexities of who might have the right, the ability, and the connections to tell those stories. There is something odd growing in Stanly's garden. Bit by bit, bone by bone, a skeleton grows out of the ground. The grown-ups can't see it, but Stanly's sister Miren can. She calls it Princy, because, according to her, Princy wears a gold hat and has a black cape. When Miren gets really sick, Princy is the only one who can make her smile. Stanly thinks Princy is bad news, and his sister is getting sicker and sicker. But Princy makes her happy. Is he bad or good? This book is very emotional - I cried for a really long time when I finished it, and I don't normally cry about books. I had a chat with my Mum, because I was very angry at Princy. Together, we worked out that the book is about hope, or maybe about how death is sometimes harder for the people left behind, than for the person dying. It is hard to say what my favourite bit was, because it was so sad, but it made me feel very strongly, and that is what a good book does. I reviewed this book for LoveReading4Kids, they are amazing! You should check them out, and you can read all reviews here.